Salora International Limited, one of the leading conglomerate and a flagship company of the Jiwarajka Group has launched two new element to upgrade it’s gadget segment in the indian market. This new elements are named as Salora SHA-3211UF and SHA-3511UF which joins the line up of the company’s multimedia speakers ranges. 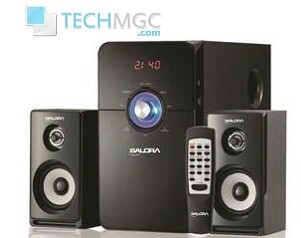 Salora is a well-known reputed player in the electronics industry of India from a long time and their business spans the complete supply chain, and includes logistics, service, manufacturing and distribution. Coming towards the launch of the day, both the speakers SHA-3211UF and SHA-3511UF speakers has been designed specifically to target the youth of the nation. The former one features a 2.1 channel active speaker system, whereas the later boasts a 5.1 channel active speaker system. Both these speakers introduced by Salora power has been offered with some amazing features which value enough to attract a bunch of buyers towards itself. Salora SHA-3511 UHF and SHA-3211 UHF supports USB player, SD card reader, digital FM, digital display, remote control, bass and treble control. It also support a direct access to MP3 file and wooden satellite speakers. The Salors SHA-3211UHF is equipped with 20W of power while the SHA-3511 UHF boasts of 60W with channel control and aux function. In terms of design, both these speakers comes with a LCD display and company members claim it to be the light-weight. Company members are also says that the main highlights of these speakers are high performance acoustics, AMP and easy installation process which help the users use them without much hassle. The price of SHA-3211UHF is Rs 2,495 and of SHA-3511UHF is Rs 4,495.